This tab is used for refunding a client. This action allows to produce a formal document for the Tax Authorities. The title of this tab will be Refund / Withdrawal Form, according to the definition of the "Use Refund Form as a Withdrawal Form" field, in the Bookkeeping tab of the System Fundamentals. Therefore, every refund action described in this page, is also applied to any Withdrawal made by "Banking services" providers or "Broker / Trading Platform" providers. The Refund / Withdrawal total amount can not be higher than the account balance. In case of wrong refund, it can be fixed be producing a Receipt document. The refund can also be used in case of returned cheque. After choosing to return the client's cheque, it will be removed from the cheques list. Create a new Refund / Withdrawal Form. For further information, please read the next section. Produce Origin Refund / Withdrawal Document. For further information Click here. Load a Refund / Withdrawal document. For further information Click here. Cancel / Retrieve Document. For further information Click here. International Document This field defines the language of the document. Choosing Yes will produce the document in English. Origin Production Time This field will automatically get the time stamp of the document production. The user can change this date up to 7 days prior the production time. Agency Choose the agency that produces the Receipt. Sales Agent Select the Sales agent for this specific document only. 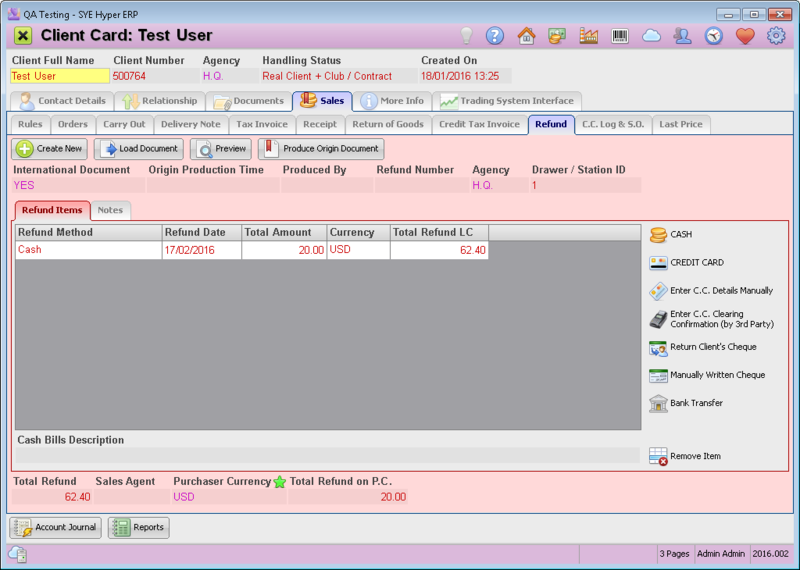 Purchaser Currency As default, the bookkeeping currency will be displayed in this field. The system allows to select other currency for this specific document only. In the center of this screen, the refund items and the payment methods are displayed as described below. This table displays all of the refunds and includes the withdrawal method, refund date, currency and the Total withdrawal. A new row will be added for any selected refund method. multiple rows can be added. according to the required refund / withdrawal. A refund / withdrawal record can be removed by using the Remove Item button. Adding receipt items is available by choosing the payment method from the list and defining the amount of payment. Cash A cash refund payment to the client. Credit Card A credit card refund payment, by using the MSR device, if Hyper is connected to credit card clearing service. This option is also used for Standing Orders for Auto Billing (in that case, the system uses the first credit card in the list, as default). Enter C.C. Details Manually Credit card refund, when its details are manually entered to the system. This option is available if Hyper is connected to credit card clearing service. If there is another clearing service which is not connected to Hyper, and it is necessary to create a record of the clearing and produce a receipt. In case of any malfunction or error that caused Hyper not to produce the receipt document. For this rare event, Hyper allows to use this option and fill in the clearing confirmation number from Hyper clearing table. Return Client's cheque Return a check which was not deposited. Manually Written Cheque A cheque payment refund. Bank Transfer A refund to the client via bank transfer. This document should be produced only after receiving the payment. After choosing the required refund methods, the user can add some notes to be printed on the this document. Also, the user can edit the client's personal details (for this document only). In the "Internal Notes" field, the user can write any note for internal use only. The internal notes will not be printed on the document. Use the "Bundled with Receipt Number" field, to bundle this refund to any exists receipt. use the Preview button to verify the details on the form. In order to produce the Refund / Withdrawal Form, press the Produce Origin Document button. The system will display a preview of the document. Press the OK button to approve it and produce the Refund / Withdrawal form. By using this option, the user can produce a certified copy of the document. The system will add the title "Certified Copy" at the top of the document. Also, according to the definitions in the client card ("Send Official Documents to Primary Email" field), a digital copy can be sent to the client. Previous / Next Record buttons, allow the user to browse through the records of the produced documents. The system allows to cancel a Refund / Withdrawal form, as described in the next section. 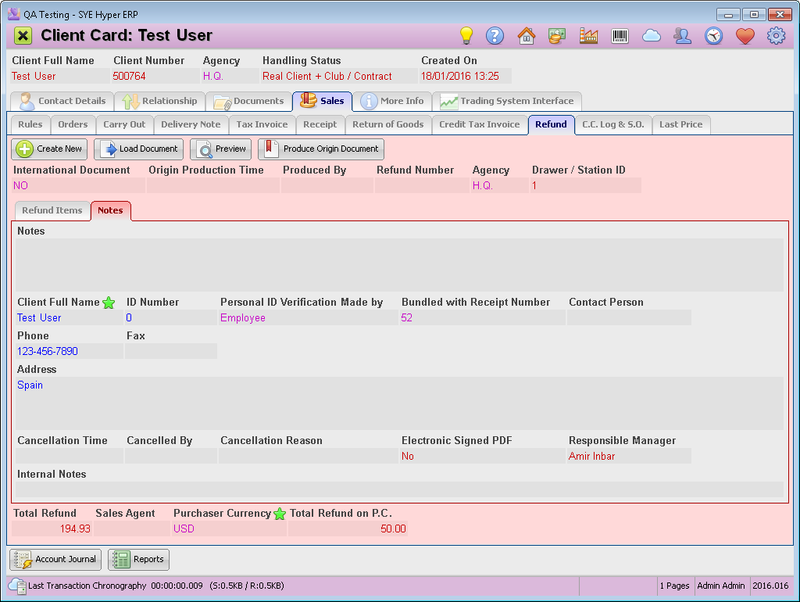 Retrieve a canceled document, as described in the next section. Load the requested document, using the Load Document button. Press the Cancel Document button. Fill in the Cancellation Reason. In the "Notes" tab, you can find the Cancellation time, Cancellation Reason and the name of the user that made the cancellation. The canceled Receipt can be retrieved by loading it and pressing the Refund/ Withdrawal Document button.